PLEASE CLICK THE TABS ABOVE TO SEE A VARIETY OF DESIGNS. Welcome! My name is Yvonne Shahoud. 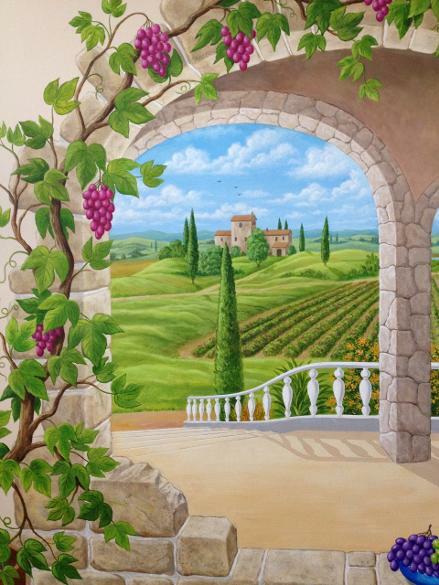 I am an artist who has been in business painting wall murals in the South Florida area for about 20 years. 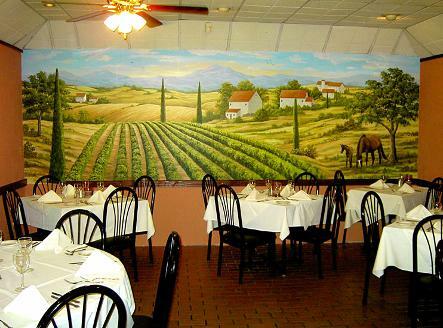 I paint custom murals in Palm Beach, Delray Beach, Boca Raton, Pompano Beach, Parkland, Coral Springs, Hollywood, Fort Lauderdale, and surrounding communities, as well as in Miami. I also am a portrait artist. 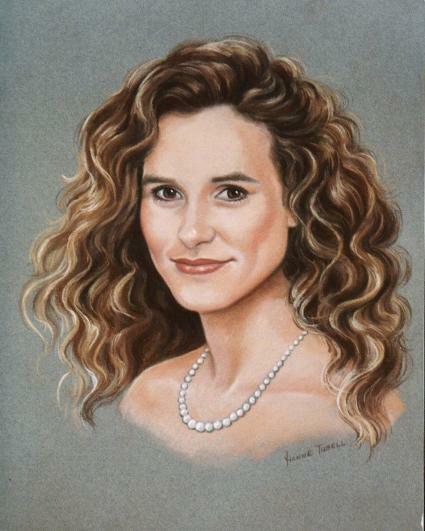 I paint portraits on commission in oil or pastel. 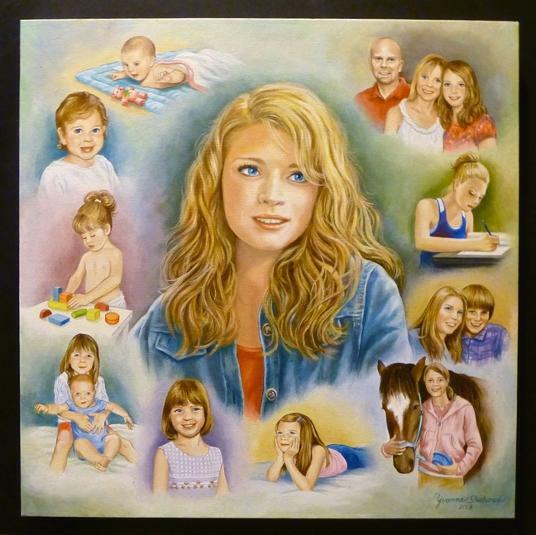 Portraits of children as well as family group portraits are treasured as family heirlooms for years to come . See samples on my "portraits" page by clicking the tab above. 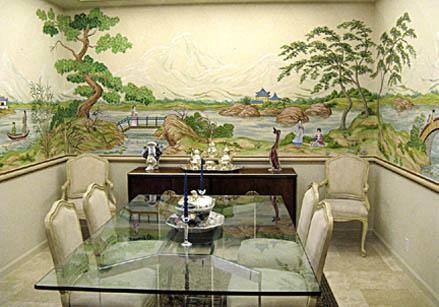 On this home page I am presenting a general selection of custom murals that were painted for my clients in the South Florida area to give you an idea of my versatility. They are painted in a combination of acrylic water based artists' paints and latex. 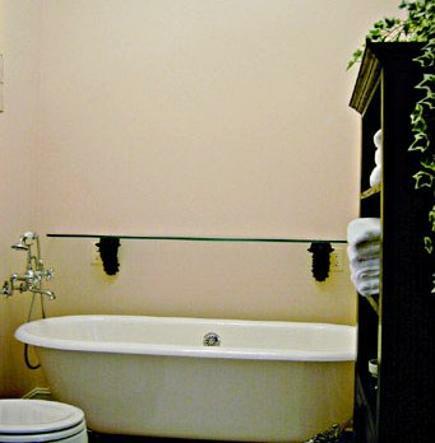 The paint dries quickly and has very little odor. Extremely resistant to fading, they can be cleaned easily with a cloth dampened with a mild solution of dish detergent and water. 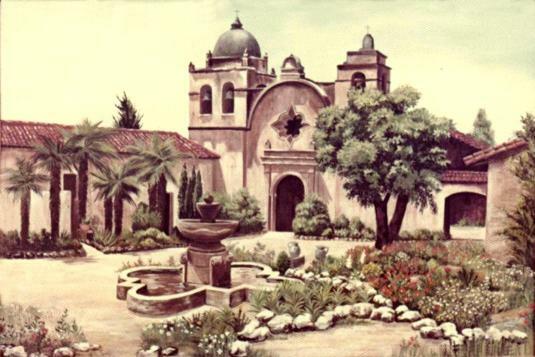 Please click on the tabs above to see additional pages of my portfolio, broken down by category. 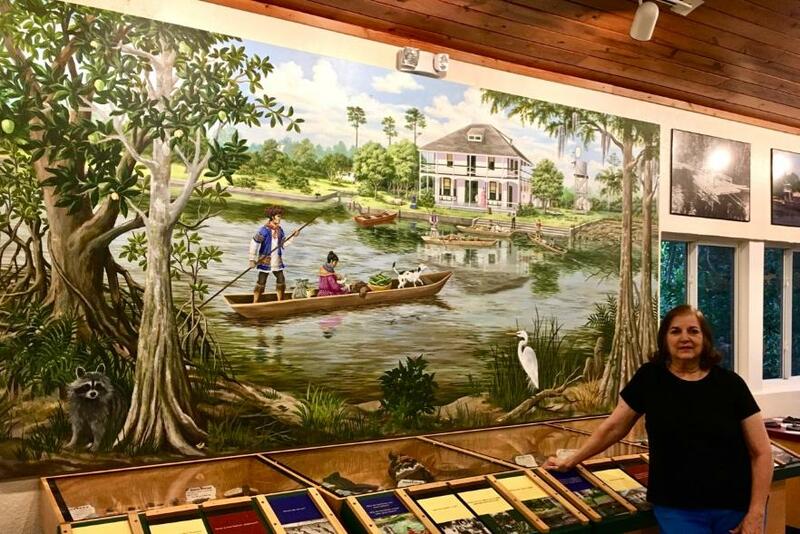 This mural depicts Seminole Indians arriving on boats to trade goods at the legendary Stranahan House (circa: 1897 to 1910) Mural painted in the Monarch building at Secret Woods Nature Center, Fort Lauderdale, Florida. Below: I put a lot of love into the painting below. When my granddaughter reached the age of 18, I decided to give her this painting as a graduation gift. Using photos from the past, I painted my memories of her at all stages of her life, from infant to high school graduate. A detail of a larger mural painted in my clients dining room. 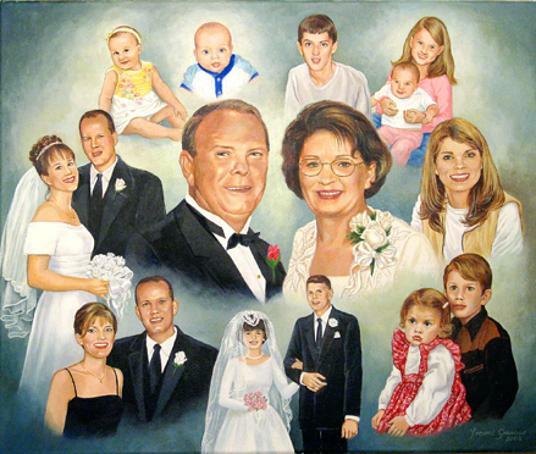 Below: Special events and treasured family members are all depicted in this portrait collage. This painting was a wonderful gift presented to the featured couple (centered). It will be passed down from generation to generation. Below: Pet portraits are always in demand. 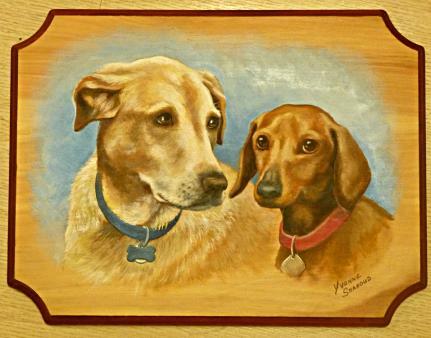 This one is painted on a wooded plaque. 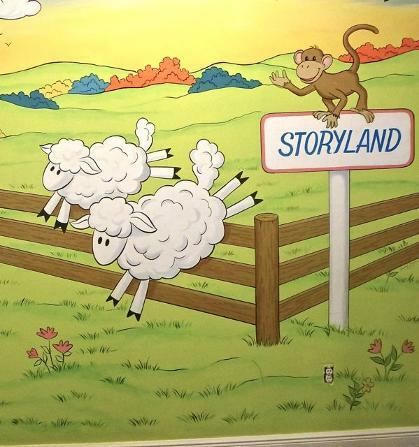 Animal themes for children's rooms are very popular. 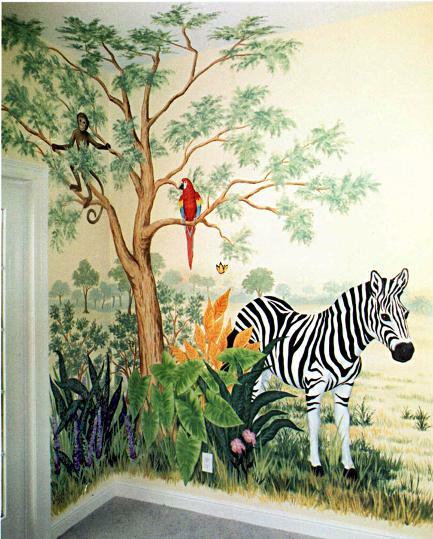 Above: A Zebra graces the walls in a child's playroom. 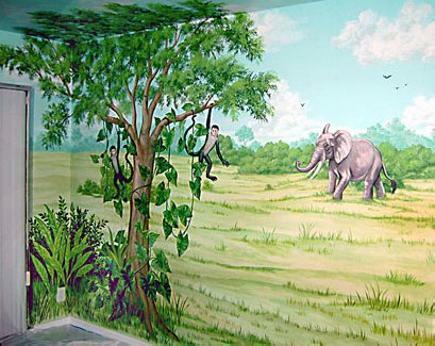 Below: Climbing Monkeys and an elephant for a baby's nursery. 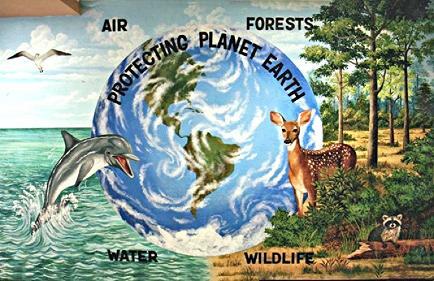 Above: A mural painted in an elementary school promoting conservation. 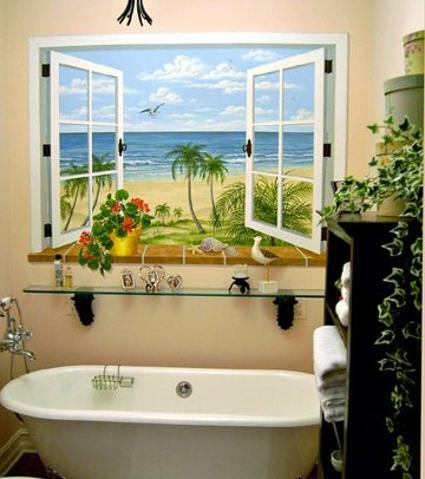 Above & Below: "Before" and "after" photos show the amazing way a trompe l'oeil window can completely brighten up a dull bathroom. The ocean view brings in light and creates a feeling of depth and spaciousness. IF VIEWING ON A COMPUTER.